First and foremost -  I would like to thank all those who brought refreshments to Redding Grange on April 9th for the Ritual Challenge Award Night. It is always nice to now that you can rely on Grangers for food. Next and not too far away - June 9th will be fast approaching and all New England Needlework judging in the Pomonas will have to have been completed and the entries brought to Cheshire Grange Hall by 9 a.m.  Judging will begin promptly at 10 a.m. - NO EXCEPTIONS! Also, all craft, baking, scrapbook and basket entries will be judged. 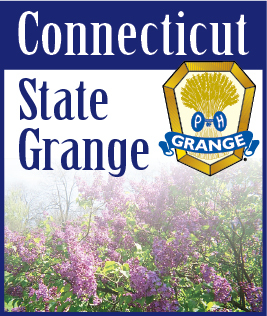 Just received word from National Grange that the quilt squares will not be judged until National Session, so we will be able to hold our judging at State Session. Hope everyone is keeping busy and enjoying the nice weather.